Saving the world from eerily familiar alien hordes. It’s Left 4 Dead with aliens down to the very core, but a flattering rendition of the formula that’s worth playing with friends. 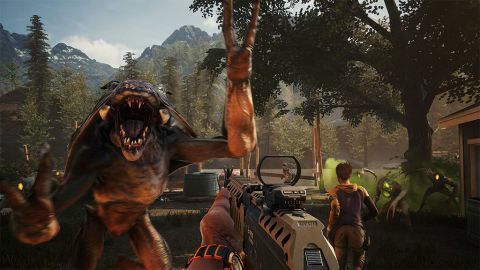 You may have already heard Earthfall called “Left 4 Dead with aliens,” and there really is no better way to quickly describe it. Almost everything—from the enemy design and behavior, the pacing of the missions, to the gunplay—so closely mirrors Valve’s zombie shooter that you could be forgiven for thinking it was a mod. For the most part, that’s not a bad thing. Stepping into the mud-caked sneakers of one of four quippy, ragtag, unmemorable survivors, Earthfall’s 10 story-driven missions task you with blasting through waves of creepy-looking aliens to complete a variety of objectives. One level has you infiltrating a claustrophobic underground facility to recover data needed by the human resistance. Another involves activating a hydroelectric dam to draw attention away from an off-map cell of allies launching a surgical strike against the extraterrestrial hive. The narrative thread running through the post-apocalyptic fight for survival is entertaining and tense, though a lot of the connective tissue that explains how you get from the end of one mission to the start of the next is, disappointingly, only explained in text dossiers you’re expected to read on your own time. And it's not exactly up to spec graphically with most modern shooters, featuring a lot of muddy and flat-looking textures. The aliens are visually distinct and eerie, but remind me constantly of how much Earthfall feels like a Left 4 Dead reskin. As with similar co-op shooters, it’s a lot more fun and less frustrating if you have a friend or three on voice chat to coordinate who’s covering you when you need to reload or who’s in charge of keeping baddies off of the person holstering their AK to activate a forklift. The bots that take over for your teammates in solo mode are fairly competent, but tend to get flustered by boss aliens and don’t do particularly well navigating enclosed spaces, even if you crank up the allied AI skill level—an option independent of enemy difficulty that seems to mostly boost their accuracy and target selection abilities. The aliens are visually distinct and eerie, but remind me constantly of how much Earthfall feels like a Left 4 Dead reskin. There are almost direct analogues to every special enemy type, including a sneaky alien that pins you to the ground and mauls you until a friend blasts them off, a lanky opportunist who ensnares you and tries to drag you away from your team for an easy kill, a bulbous green thing that explodes and leaves behind a toxic cloud, and a towering brute who eats bullets for breakfast and forces everyone to stay on the move. The basic cannon fodder nasties behave pretty much like your standard zombies, attacking in huge mobs and trying to melee you death with paper cuts. The one exception is the Blackout, a boss-tier psychic squid thing that looks like it emerged from XCOM. With the ability to teleport, launch rapid-fire energy barrages, and summon rotating deflector shields, this guy was the only enemy Earthfall threw at me that I needed to invent new tactics to deal with rather than falling back on my horde shooter muscle memory. That was a nice touch, but I wish there had been more surprises like it, especially when it's competing for my time with more inventive genre mates like Deep Rock Galactic and Vermintide 2. The guns I scavenged to mow down extraplanetary, invaders leaned a bit too far to the arcadey, hitscan side of the spectrum for my tastes, whether I was clearing corridors with a chunky shotgun or thinning the horde from a church balcony with a highly accurate battle rifle. The kickback and sound effects are satisfying enough, but the flinch and death animations for the aliens didn’t sell the power of the weapons all that well. It never gets old watching a drone’s head explode from a perfect shot between the… whatever their sensory organs are, but the fairly tame slump they do even when hit by something potent like a high-caliber sniper rifle was underwhelming a lot of the time. I wished for some truly exaggerated, ragdoll-laden bloodbaths. Despite not always feeling empowered by the heat I was packing, the running and gunning is plenty of fun—especially when you get temporary access to a special heavy weapon like the Harbinger chain gun. Obliterating dozens of oncoming ETs while your friend tries desperately to get the power back on is a satisfying rush. The ability to 3D print specific guns at special stations helps ensure that you can usually have your pick of a firearm that suits your playstyle even if you’re not able to loot it on the map normally. At the same time, ammo is sparse enough that most missions will force you to conserve your heavier-hitting boomsticks and rely on melee attacks or the bottomless basic pistol in lower-intensity situations, which adds to the tension and pacing in a positive way. The inclusion of deployable, stationary barricades and automated turrets create a fun and challenging tactical layer on a lot of maps. Certain areas that seemed frustratingly difficult, like an abandoned church with a lot of entry points, became rewarding puzzles when my multiplayer group got the hang of using barricades to funnel the horde into a more manageable set of kill zones. Across all 10 chapters, the level design is admirable. Progression between objectives has a good flow, there’s a nice balance of defensible choke points without any area being so linear that you don’t have to worry about being flanked at all, and much like Left 4 Dead, there are plenty of tense holdouts that involve activating an objective or getting to an evac zone while being bombarded by absolutely withering levels of opposition. The rush of making it to the chopper with five percent health and two dozen bloodthirsty space beasts trying to claw your remaining vertebrae out is enough to keep me coming back. While calling Earthfall derivative of Left 4 Dead might even be an understatement, it's an entertaining variation on that theme with a great extra layer of map control added by the barricade system. I wish it had pushed harder to differentiate itself, especially in the design of special enemies. But if you’re looking to satisfy your co-op horde shooter craving with Left 4 Dead 3 still nowhere on the immediate horizon, you could certainly do a lot worse.